Workers of the Guyana Geology and Mines Commission (GGMC) have been awarded a one-off payout in keeping with an agreement with the Guyana Public Service Union (GPSU), Minister of Natural Resources, Raphael Trotman announced Friday. Still faced with cramped working conditions, the staff was also told by GGMC Board Chairman, Stanley Ming that work has begun to find a plot of land to construct the entity’s own headquarters. This effectively means that government has abandoned plans to rehabilitate the unoccupied faulty building at 44 High and Princess Streets (where the radio station was once located) to house the regulatory body. Addressing the annual awards ceremony at Parc Rayne (formerly Republic Soda Factory), Rahaman’s Turn, East Bank Demerara, he said the union formally accepted the GGMC’s offer to resolve outstanding matters. He explained that means there will be a six-week bonus based on January 1, 2015 salaries. “Government sees this is an indication of goodwill and a recognition of an improved attitude within the theatre of our work. 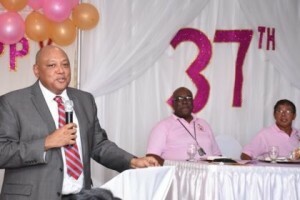 We expect that it will also be seen an incentive to you to continue on the trajectory and do better especially to do better where better is needed,” said Trotman to rousing applause. The minister explained to Demerara Waves Online News that the GPSU had asked for a 25 percent salary increase but after long negotiations it was agreed that instead a six-week bonus would be paid. This effectively closes negotiations for wages and salaries for 2015 to allow the two sides to begin 2016 wage and salary talks. The Minister of Natural Resources remarked that the pay dispute had been going on for quite a long time and he credited GGMC Commissioner, Newell Dennison with leading the negotiating team with the GPSU. The GGMC is responsible for awarding offshore and onshore concessions and regulating the mining , and oil and gas sector. Meanwhile, the GGMC Board Chairman announced that “in the very near future,” workers would have a custom-built building to house their entire operations. “We are working on a project where we will more than likely within a year’s time or less acquire a significant portion of land where we can build a new GGMC to house everything…,” Ming said. Ming praised government for not interfering in the work of the policy decision-making body. “Not only did the minister give me his word but to date since I have been the Chairman, I have had no call from him instructing me or anything and the Commission is being allowed to function the way it should be from the inception about a year ago,” he said. Ming is a former financier and executive member of the People’s National Congress Reform (PNCR), the major partner in A Partnership for National Unity (APNU) which last year joined force with the Alliance For Change to win the general and regional elections. Trotman was also a member of the Reform component that had joined the PNC under then party leader Desmond Hoyte. Ming said he and the rest of the board take a knowledge and solutions-oriented approach to managing the semi-autonomous regulatory agency by involving the workers through management upwards to the board.